Imagine you’re sitting in an auditorium and the house lights are up. Your eyes are suddenly drawn to a glamorous woman in a glittering costume standing on a balcony on the stage. A hush descends. Around you heads are turning to look; it’s not entirely clear why, as she is yet to speak or even move. What is happening, without the audience realising, is that the lights have started to shift. Attention is drawn to her, subliminally, subconsciously, by a series of lights focused very specifically. One is on her face at 10% intensity, another behind her is a bit brighter and a bit cooler, while others project a glow around her. Those beams are imperceptibly conjuring her spirit from the air. That one moment, that one breath of the show, needs 10 lights with five different cue states. Each of those cues has different lights in different colours fading to different levels at different times. Now slowly, the house lights come down, she lifts an arm and the orchestra strikes up. The stage comes alive; light is what makes it breathe. This was the opening of Follies at the National Theatre earlier this year. But the ability to weave this sort of magic with light on stages across Europe is under serious threat from the most prosaic of directions: energy efficiency regulations for light bulbs, proposed by the European Union. I often have anxiety dreams around making shows, but this nightmare is much worse: the prospect of theatres across the country going dark, literally, is very real. The industry is sleepwalking into accepting this EU legislation – which has nothing to do with Brexit by the way – and the result, if enforced as currently envisioned, will mean that shows such as The Phantom of the Opera and The Book of Mormon, The Lion King and Hamilton will ultimately either have to close, or be presented in a hugely compromised manner. What does ‘compromised’ mean in this context? Maybe not quite the feel of the lighting in an office or a warehouse, but pretty close. The subtlety, detail, life, vibrancy and precise control would be gone. Those watching who had not previously understood the importance of the lighting designer and their team of technicians would understand it pretty quickly. Each lighting designer has their own artistry, their own aesthetic. Many would say mine is stripped back. It is the lighting kit currently available that allows me to express ideas fully. Originally I wanted to direct – many people do – but I was drawn in by the possibilities of what lighting offered very early on, of the artistic possibilities – its ability to help tell stories. My early work was with companies including People Show and Complicite; we never had any money, but we had a lot of ideas. We could conjure worlds with simple sets and the right lights. This legislation threatens everyone, from those now starting out with their big idea and their lights, through all of the West End, through the repertoires of drama, opera and dance across Europe. Not a single show I have ever lit – not War Horse, not The Curious Incident of the Dog in the Night-Time, Follies, Angels in America – could be created in a way even close to how they exist now; these regulations will take away the lighting tools we’d need to create them. This doesn’t just mean the tools that use traditional tungsten light bulbs. The last big conversation about this was in 2012, when EU regulations wanted to phase out tungsten’s use. At the time we didn’t feel like the newer LED sources were at a point where they could replace the existing kit. They were quite crude. You could do tricks with it, but it had no soul (though that’s a difficult word to frame an argument to the EU with, since it’s impossible to define or to measure). They didn’t make people or costumes or sets look good. It was hard to create light in the air, curtains of light through smoke for images to appear through, as we do in War Horse. In the time since, technology has improved. Things have got better. The best LED fixtures now do a good job of aping tungsten light sources, and can do much more besides. I use them often. Problem solved? No, because these LED units we are now using – carefully developed with the manufacturers to give us the low-energy usage of LEDs as well as the lyricism and quality of light we need, and those beams – also do not pass the proposed rules. The lights that would remain will barely dim, let alone let us present the complex stage pictures that are so central to our performing arts, whether in musical theatre, ballet, opera or live music. This covers all the lights we use, in all the shows. I’m talking about our opera houses, our theatres, our concert stages, our school halls, our village halls, our pub theatres. It really is that bad. I’m not a luddite. I am an environmental campaigner. I do a lot of lobbying for Julie’s Bicycle, the charity that supports the creative industry in becoming more environmentally sustainable. I lead on the sustainability forum at the National Theatre. We want to change and we encourage it, but nothing will be gained from this scorched-earth approach. Ideally, we need to keep the exemption as it currently stands. And then, using that, we need a period of development, of phasing out the old kit and replacing it with the already much more efficient new. The problem with the laws being proposed is that they are so draconian we have nowhere to go, and no time to get there either. This is really not about lighting. It is about theatre, about live performance as a whole. It is about all of our lives and all of our livelihoods. Please help. Back the campaign to Save Stage Lighting – look us up – write to your MEP, talk about it, get informed. Spread the word. When you go to the theatre – and the house lights fade out – a story is told through sound, performance, scenery and costume. But without lighting, the quality of that storytelling will be broken. 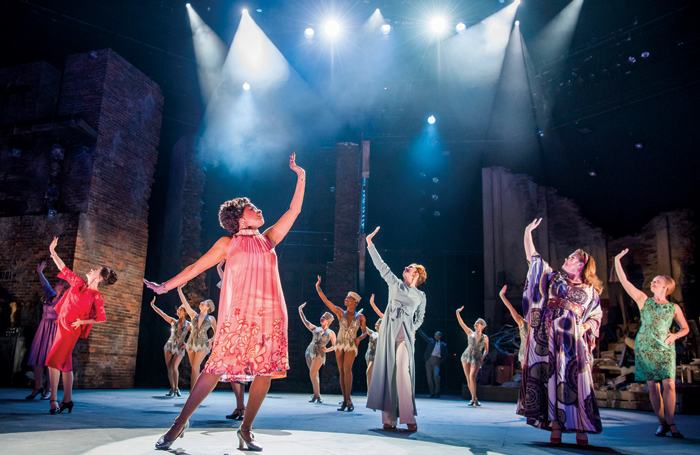 It might be possible to create a crude, image-by-image version of a show like Follies, but you couldn’t get anywhere near to the artistry, the lyricism and the depth of storytelling that the current lighting brings to it. Without the right tools, I can only give you a very crude, very bland show. A show without the liquid magic of how light can transform a stage, the fading and the dimming, the subliminal receding and the dramatic piercing. A show that won’t move you. We need the tools to create the pictures that the audience has come to expect, that takes them on the journey of the show, that moves them. Otherwise our world will be a much darker place.